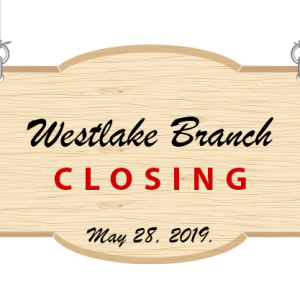 Cardinal Credit Union has made the difficult decision to close its Westlake Branch, located at 26931 Detroit Rd., Westlake, OH. While this branch will permanently close its doors on May 28, 2019, Cardinal will continue to operate as it has for over 66 years. The branch staff will take other positions within the credit union. Read on to learn about some alternative service options that are available to you. Please review the accompanying Member Resource Guide for convenient access options. We continue to offer amazing deposit and loan rates. Our 12-month certificate is paying 1.96%APY and 18-month certificate is at 2.16%APY*. These rates include relationship incentives for members with Interest Plus Checking and a VISA® credit card. We also offer online banking, mobile banking for iPhone and Android phones, plus remote check deposit, free call center service and convenient access to over 43,000 no-surcharge ATMs. Cardinal also participates in “Shared Branching”, a national network of credit unions from across the country that allows you to perform transactions just as if you were at one of our branches. The nearest participating credit union is CommStar CU with branches in Avon and Elyria. Go to www.co-opcreditunions.org to look up shared credit union branches and ATMs. If you currently have a Cardinal loan, please let us know if you would like a coupon book to assist with managing your payments. Should you have any questions about the information provided here, please call us at (440) 266-2200. We appreciate your understanding, and are grateful for the trust you place in us as your financial partner. We look forward to serving you well into the future. *Annual Percentage Yield (APY) is accurate as of March 25, 2019 and is subject to change. $500 minimum deposit required to obtain APY. A penalty may be imposed for withdrawals prior to maturity. 12-month term annual percentage rate is 1.94%. 18-month term annual percentage rate is 2.14%.